The rise of social networks is changing the way people interact, communicate, form opinions, and make purchases. 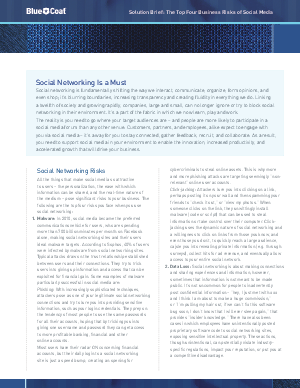 And as more users utilize social networks, businesses must support social media to both target their audience and enable innovation, increase productivity, and accelerate growth that will drive their business. However, all the things that make social media so attractive to users - the personalization, the ease with which information can be shared, and the real-time nature of the medium - pose significant risks to your business.